Louis Vuitton handles are made of natural cowhide leather. Handles on fake bags are often made of plastic. “Over time, when you’re using leather handles on a real Louis Vuitton, it patinas over time, which means it gets this nice honey brown color to it. When handles on fakes are made of plastic, the handles get dirty, but there’s no patina to it at all. It’s just nasty, dirty plastic,” Bernstein said. Louis Vuitton bags are made of coated canvas and trimmed in cowhide leather. 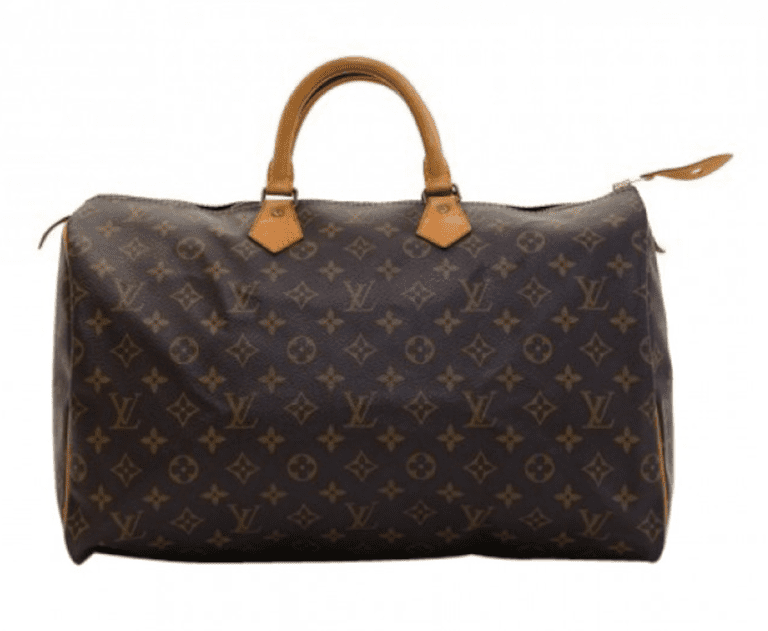 Its iconic monogram canvas features repeated LVs, diamonds, circles, or flowers that are all the same size and symmetrical. Don’t be alarmed if the monogram canvas and LVs are upside down — real Louis Vuitton Speedy bags are made with one continuous piece of fabric that goes all the way around the bag. One side will be right side up; the other will be upside down. On fake bags, the trim is often plastic instead of leather. Whether it’s an LV or Louis Vuitton spelled out, the logo will never be sliced through or cut in half on real bags. The name and logo will always appear in full form. On a fake bag, Louis Vuitton can be sliced through. Louis Vuitton Speedy bags have a canvas lining — never suede or leather. For other styles, find out what type of lining it should have, either online or by stopping in a Louis Vuitton store. Louis Vuitton bags feature brass hardware. “If it’s an older bag, brass will sometimes oxidize and turn a little green. That’s something that people question, but it’s nothing to worry about,” Bernstein said. On fake bags, hardware is made of plastic that looks like brass. Louis Vuitton bags made in the early 1980s and after will have a date code inside. Make sure that the date code makes sense for that particular style of bag. For example, MB0951 means: MB for manufactured in France. The first and third numbers (0 and 5) indicates the month May. The second and last numbers (9 and 1) indicates the year, 1991. Only bags from the 1990s to 2006 follow this pattern. There are a few other styles of date codes. Limited edition Louis Vuitton bags are harder to counterfeit: “Limited edition bags, like the Louis Vuitton Vernis Melrose Avenue bag, are definitely more difficult to knock off. You will see knockoffs like that, but that bag is so intricate and the hardware is so heavy. I’ve seen good knockoffs of limited edition Louis Vuittons, but it’s not as prevalent,” Bernstein said. Look at real Louis Vuitton bags in person: Stop into a Louis Vuitton store to see, touch and try on real Louis Vuitton bags. Take note of their quality, craftsmanship and details (including the lining), so that you can dodge fake Louis Vuitton bags in the secondary market. Take a questionable bag to Louis Vuitton: If you have a Louis Vuitton bag that you’re unsure about, take it to a Louis Vuitton store and try to have it repaired. If it’s fake, Louis Vuitton will refuse it. “It might be embarrassing, but you can always say it was a gift,” Bernstein said.